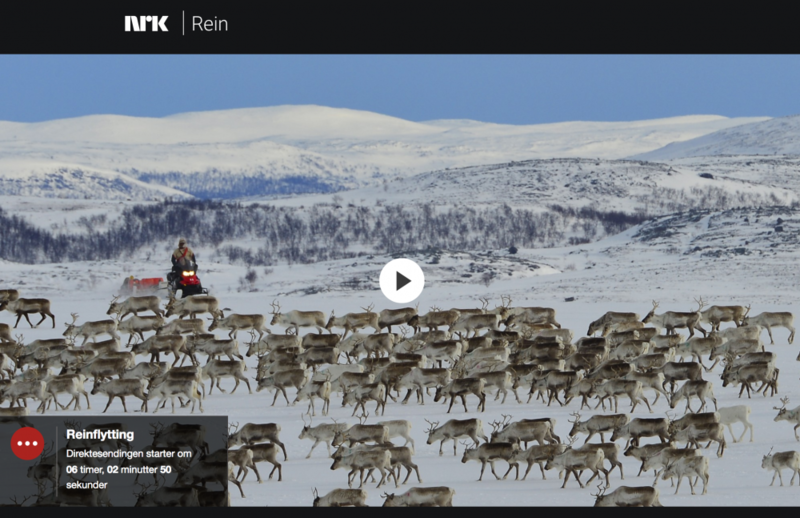 Weeklong 24/7 live broadcast follows the Sami herder family and almost 1500 reindeers from winter to summer pastures. Starting Monday evening, a TV team from the Norwegian broadcasting corporation NRK, will provide TV viewers with amazing pictures of the journey from between Lake Iesjárvi on the Finnmark mountain plateau to Kvalsund on the coast to the Barents Sea. The 100 kilometer journey will take a week, weather depending. Broadcasted line on national TV, the more than 20 people large team uses creative application technology to film the migration. A GoPro camera is attached to one reindeer, drones films from the air and other camera crews drives alongside with snowmobiles. NRK has had great success with Slow TV projects over the last few years. Earlier, shows like «Hurtigruten minute by minute» and «Nordlandsbanen minute by minute» have given the viewers the feeling of being present in real time and space, along the coast and along Norway’s longest railway line. The reindeer herding show TV has its own portal were updates and track-the-herds-on-map are provided. At this time of the year, the TV viewers don’t have to worry about lack of light during night time. Although the midnight sun is not yet shining, Finnmark nights are light enough for good views. Viewers outside Norway can follow the 24/7 live broadcast on web.